I got the picture above sent to me over the week of the 4th. 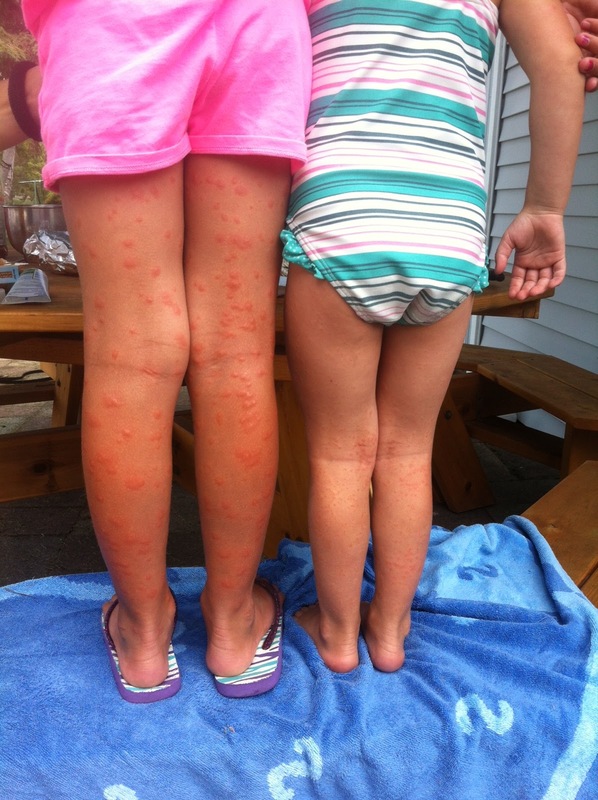 The girls were up at Grandmas with daddy and got chiggers. At first I thought Alex got them the worse and Avin didn't really get the bad end of the stick. When I talked to the girls on the phone Avin had assured me hers were just "baby bites". But I found that to be wrong when she got home and I could not believe how her legs looked and felt. Alex legs where pretty much healed but poor Avin was still itching like crazy. She was waking up 2 times a night for the next two nights and there was not a thing I could really do for her but put more itchy free lotion on her. Thankfully after being home for 3 days they finally started to clear up and let her be. In the 7 years that I went up to the lake we had never experienced chiggers and now I hope to never experience these little buggers ever again. I could not believe how they felt, I think that is what drove me insane when I had to put lotion on her legs or hold her, almost like chicken pox is what it reminded me of. The Trombiculidae (/trɒmbɨˈkjuːlɨdiː/ (also called berry bugs, harvest mites, red bugs, scrub-itch mites and aoutas) are a family of mites. 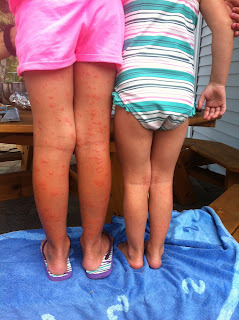 In their larval stage, those species which bite their host and cause "intense irritation" or "a wheal, usually with severe itching and dermatitis," are called chiggers. The term "chigger" is often confused with the term "jigger", the chigoe flea (Tunga penetrans) - the name chigger originated as a corruption of chigoe. Trombiculidae live in the forests and grasslands and are also found in the vegetation of low, damp areas such as woodlands, berry bushes, orchards, along lakes and streams, and even in drier places where vegetation is low, such as lawns, golf courses, and parks. They are most numerous in early summer when grass, weeds and other vegetation are heaviest. 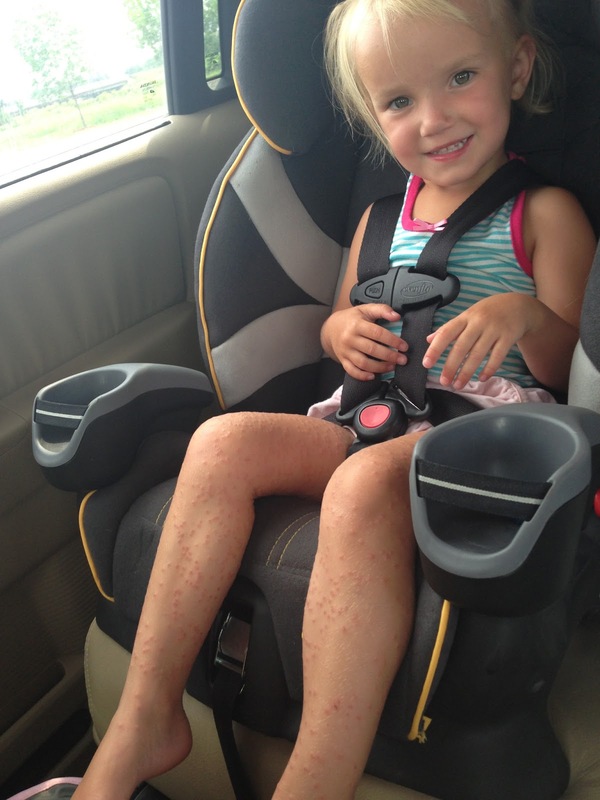 In their larval stage, they attach to various animals, including humans, and feed on skin, often causing itching. These relatives of ticks are nearly microscopic, measuring 0.4 mm (1/60 of an inch) and have a chrome-orange hue. There is a marked constriction in the front part of the body in the nymph and adult stages. The best known species of chigger in North America is the hard-biting Trombicula alfreddugesi of the southeastern United States and humid Midwest and Mexico; in the UK, the most prevalent chigger, called the "harvest mite", is Trombicula autumnalis, with distribution through Western Europe to Eastern Asia, but is not found in North America nor Australia. - wikipedia - taken off of ! Here is to hoping we never deal with this little buggers again!